You will undoubtedly be familiar with the Net Promoter Score (NPS), the most essential tool organizations use to measure customer experience. However, a crucial yet often forgotten aspect is the customer’s voice. Data analysts tend to get bogged down in statistics, losing sight of that all-important other component: the qualitative side of things. What do customers say about your company on forums and in emails? To get the best results, you need to pair the NPS with this type of information. Quality and quantity: look at both! For a long time, organizations have over-concentrated on revenue, sales, margins – in short, figures. Likewise, contact centers have been judged on figure-based aspects such as the average handling time. But in today’s world, it’s no longer enough. It’s all about the overall customer experience. If you determine value based on the effective combination of the NPS and the customer’s voice, you’ll up your game. How? Let Visual Management help you. You’ve got a range of incoming channels: your contact center is handling emails, phone calls, and texts. Now, suppose that every reply is directly entered into the system and processed automatically. 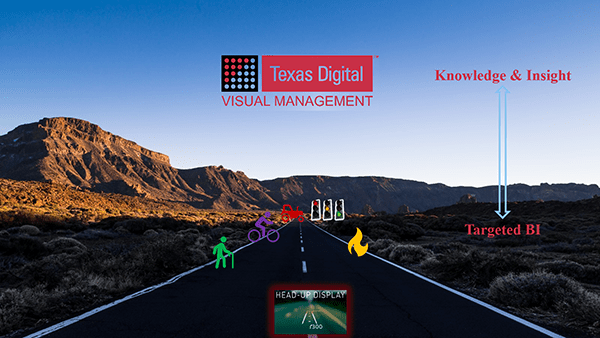 Texas Digital’s solution can read out these systems immediately and make the information available in an actionable manner. No more waiting for end-of-the-week reports. Sure, you’ll still get them, but you’ll have the power to deal with today’s problems today – not tomorrow or, worse, when the week is over. Let’s put it like this. Imagine you’re driving down a long road, right into the desert. Your navigation system tells you to turn right in fifty miles. Mind you, that’s the plan. And it sounds great. But the robot voice does not take cactuses, coyotes and other bumps in the road into account. The same goes for an organization’s plan: it’s wonderful in theory, but it assumes a clean road ahead. If you don’t want to get into an accident, you’d better embrace Visual Management. That way, you’ll always be able to adjust as you go! Want to stay on track with Visual Management? Please don’t hesitate to contact us. We’d be happy to perform a Quick Scan and discuss your Visual Management opportunities.